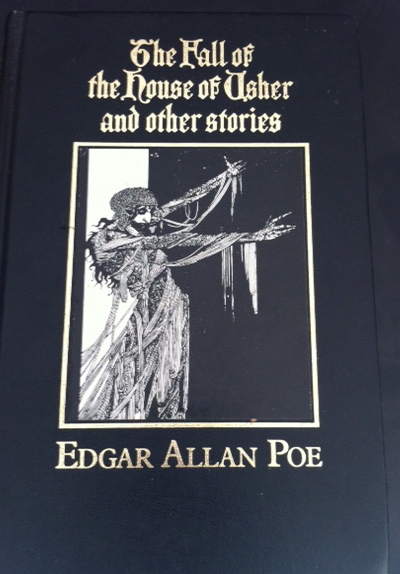 I recently found this copy of Edgar Allan Poe‘s tales in a second handbook shop and of course with it’s disturbing front cover I had to buy it. My favourite poem is The Raven and I had previously read The Tell Tale Heart but most of the stories in this book were new to me. The Murders in the Rue Morgue – A clever murder mystery with quite a disturbing killer. The Pit and the Pendulum – A prisoner, guilty of an unknown crime is placed in a chamber and is subjected to tortures. He is trapped under a slowly swinging pendulum and needs to escape. The Black Cat – Perhaps the most gruesome of his stories. A tale about a man, cats and murder. The Tell-Tale Heart – The classic story of a man’s guilt taking over his sanity. The beating of the heart coming from under the floor boards is genius. The Fall of the House of Usher – A tale about a strange brother and sister who live in a creepy house where bizarre events take place.